There have been numerous Microsoft Surface phone rumours and stories back at least three years. The most recent HEXUS story regarding a compact and foldable Surface was in March 2017, when we saw a Microsoft patent for a twin screened book-style device. Just ahead of the weekend The Verge got hold of an internal Microsoft document which describes a pocketable Surface device. Is this the highly anticipated Surface phone? Microsoft blurred the lines between tablet and laptop PC with the introduction of its Surface range of convertibles back in the summer of 2012. Though it was described as a "fairly compromised, confusing product," by rival Apple, it has gone on to sell well and contribute to Microsoft's bottom line over several generations. With the new Surface device, codenamed Andromeda, Microsoft hopes to repeat its device category blurring success with something that can be considered both a PC and a mobile. We've already seen the ground work done for this with technology like Continuum. In the documents seen by The Verge, Microsoft says it will create a "new and disruptive" device category. It goes on to describe how Andromeda is a "pocketable Surface device form factor that brings together innovative new hardware and software experiences to create a truly personal and versatile computing experience". Andromeda includes a wraparound display that bridges the gap of the hinge when it’s fully opened, according to the source. 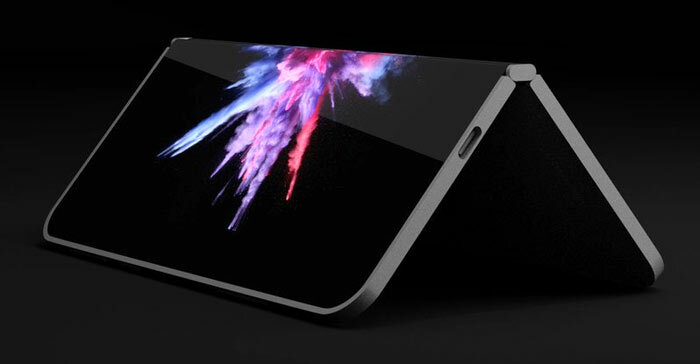 Furthermore, The Verge asserts that engineering samples of the new Microsoft Surface device look "identical" to some 3D renders of the rumoured device shared on Twitter by designer David Breyer. Breyer has quite a few interesting pictures on his Twitter page showing the Surface mobile in a sober business style, and in 'gaming mode' with Xbox controls on the lower screen. All the pictures in this article are courtesy of Breyer's Twitter feed. But of course Microsoft have a renowned reputation in the filed of phones…. I don't think that's very fair, their Microsoft WM8 phones were fantastic but their problem was they didn't create a decent application ecosphere fast enough. They also promised a migration tool to migrate Java apps into C# but never completed it so the hop off to Windows Mobile wasn't very appealing having to learn how to do C# then completely re-code your app. Personally, I think Microsoft should have aggressively cornered the Enterprise Mobile market like Blackberry used to have and then in the future re-broach into the commercial world. Whilst I agree that Windows Mobile after version 6.2 was a massive failure (however was brilliant before that :) Particularly with Sense UI on top) I don't think this new device, if it ever comes to market, would fall into that segment. It's not (from what we know) intended as a phone. The key to making this work is to NOT make this another Windows RT like device - that means they need to launch it with full x86 Windows support, including “legacy” apps. I can see a lot of potential if they take that approach, but much less so if they lock down what will run on it. Time and specifications will tell I guess..but could be great if Microsoft can really crack the form factor.